Christmas is all encompassing. 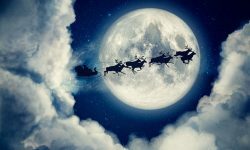 The Christmas spirit isn't something that you experience only at home. When it's that time of year, you feel the Christmas spirit all the time, and everywhere you go. So does everybody else. 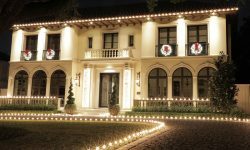 When people are out and about during the holiday season, they expect to see lots of grand displays of Christmas lights - and not only in residential neighborhoods. They expect to see those lights everywhere. That's why your business should take part in the celebration of Christmas. It's expected. It's appreciated. And decorating your business for Christmas can have a very positive impact upon your business. 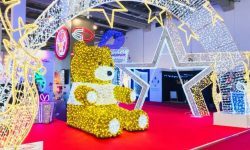 Your commercial Christmas decorations can improve customer goodwill and increase traffic to your business. And it doesn't have to be a massive, complicated display. 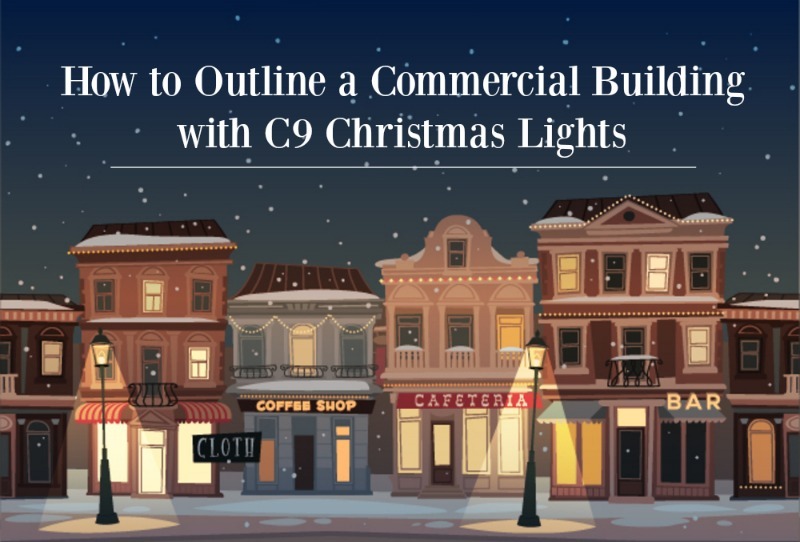 One of the best ways to decorate a commercial building for Christmas is to install a simple yet elegant outline of C9 lights. It's easy to do, and packs a potent visual punch. Building your C9 light lines from empty socket light line is the best way to go. You can purchase empty socket light line by 500-foot or 1,000-foot rolls, or our smaller runs measuring in 50, 100 and 250-foot in length. You'll be able to create customized light lines of any length you need. All you have to do is measure and cut the empty socket line, slide on the electrical plugs, and screw in the C9 bulbs. That's the best way to create a professional-looking installation, because every single line will be exactly the perfect length. Using empty socket light line also gives you extra flexibility in choosing from a number of different bulb spacing. C9s are big bulbs. So you'll want to be careful with the bulb spacing you select for your light lines. In most cases, a minimum of 9" or 12" spacing will be preferable. If you're decorating a multi-story building, keep in mind that the higher the elevation, the closer together the lights appear from the ground. So with each additional story in height, you can spread the bulb spacing out a bit more without reducing the visual impact of the display. 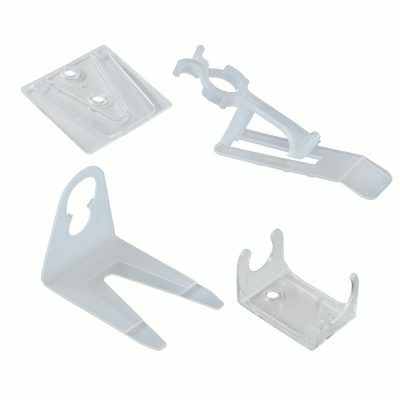 There's a wide range of clips and hardware available for attaching light lines to your building perimeter. For every location and type of material to which you'll be attaching light lines, there's a best-for-the-job attachment clip. You'll be wise to use only commercial-grade clips. And always use one attachment clip for every bulb socket, even if you've selected a close bulb spacing. If you're a newbie to installing light lines, spend some time perusing our comprehensive guide to lighting clips and hardware. This resource will provide you with guidance in attaching your light lines to every conceivable type of material and structure. If you'll be using empty socket light line to build your own custom lines (highly recommended), you'll be installing electrical fittings on each line that you build. Don't worry - it's very easy. 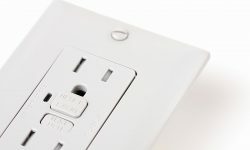 The plugs just slide on; no tools required. And if you want some guidance, you can refer to our online illustrated tutorial. 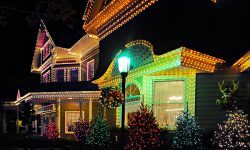 Creating perimeter lighting displays that consist of a single color can evoke some mixed reactions. For some, that display might deliver a powerful visual impact. For others, though, it might seem a bit bland and boring. Candy Cane Lines: Nothing's more Christmassy than a candy cane. So why not consider lighting up your building with candy cane colors by installing alternating red and white bulbs in your light lines? A Traditional Look: Create a traditional look by going with the primary Christmas colors of red and green. Christmas Tree Style: Most Christmas trees are decorated in a smorgasbord of multicolored lights. And that same approach can work well for commercial building perimeter lighting. 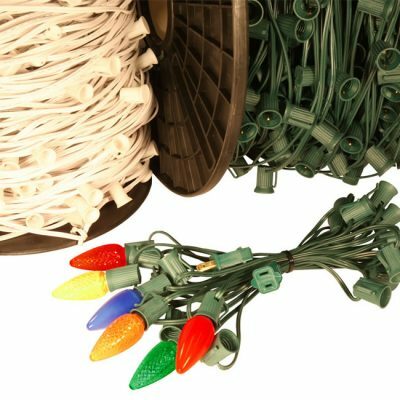 Be careful where you shop for your lights and installation supplies. Avoid the big-box stores and mega-retailers that buy cheap and sell cheap. The money you save will prove to be quite costly in the long run. 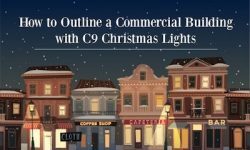 Buying professional-grade C9 lights from a specialty retailer will cost you more upfront. But your lights will look better and last longer. Put simply, buying top-quality lights from a specialty retailer will prove to be a great business decision.